I'm not sure why, but I have been loving bow ties lately. I just can't get enough. They are so darn cute, I can't stand it. 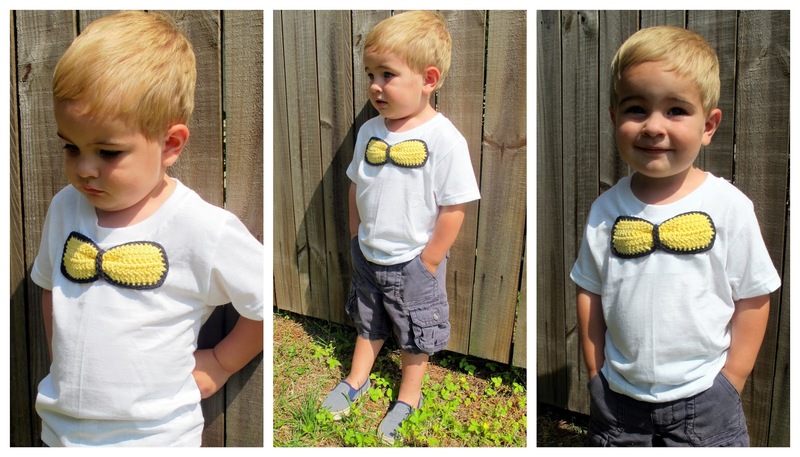 I have seen so many bow tie tutorials with these amazing fabrics, and especially the bow tie/tie appliquéd shirts and onesies. I really love them, but I just don't have the budget to buy cute fabric all the time. 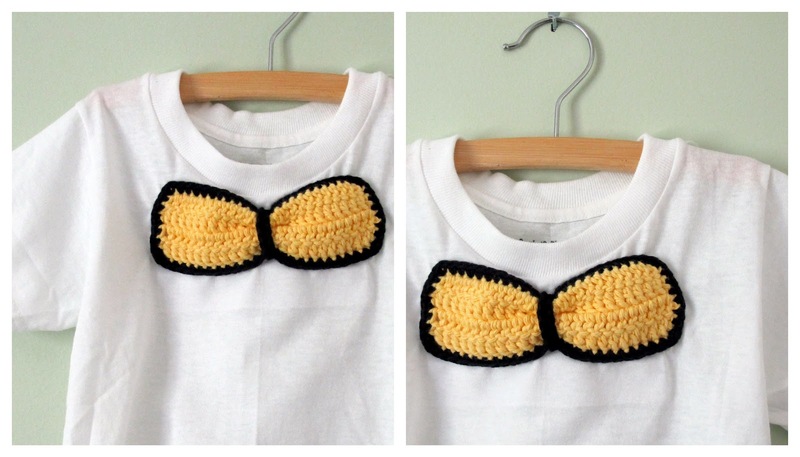 I added a crochet bow tie to a couple plain t-shirts. I am still trying to figure out what I think about them. These shirts didn't quite fit the vision I had in my head, but they aren't terrible. 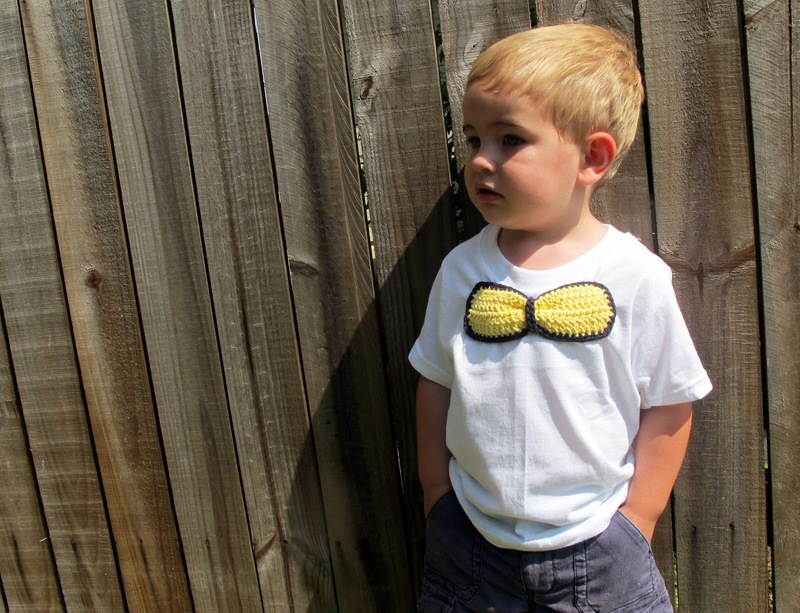 I love yellow, even for boys, but I am not a huge fan of how this yellow/navy bow tie looks. Too much like a bumble bee. 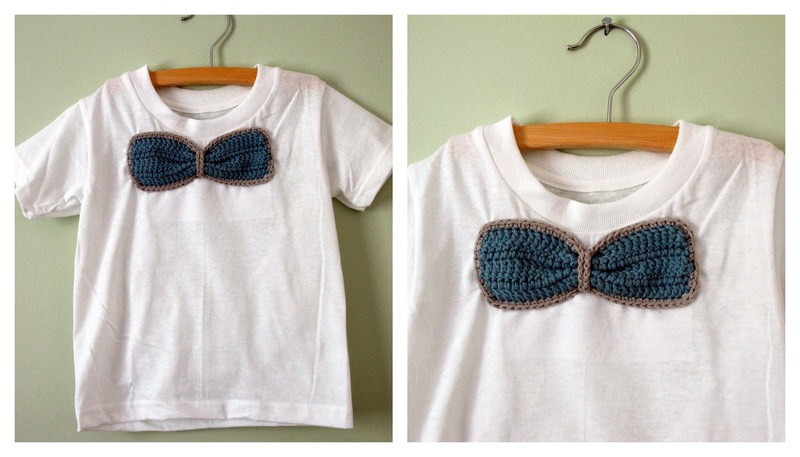 I like this blue one a lot better, but I still am wondering if these bow ties look too much like girly bows instead? I also tried this out on a onesie I had laying around and for some reason I think it looks better than the toddler t-shirts do. 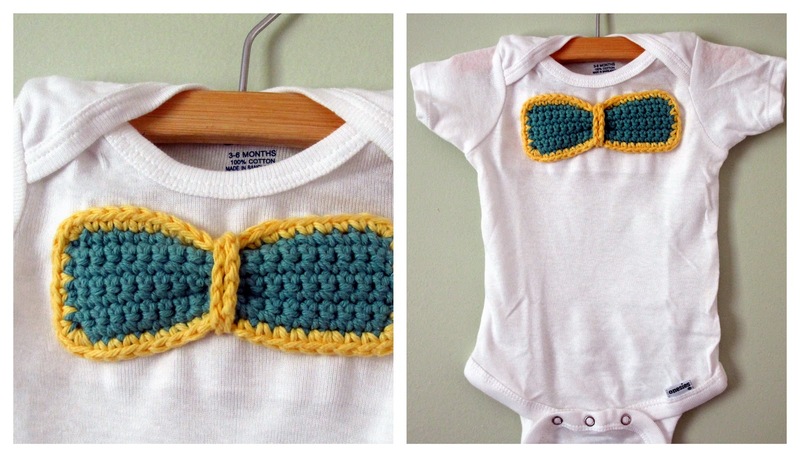 I also love the colors I chose for this one, the teal/yellow are so bright and fun. I don't know, I need some time to figure out if I will let Ande out of the house in one of these. What do you think? Do they look like enough like bow ties? cutest thing ever! what a great idea! Very cute! Maybe you could do a double-layered one next time. 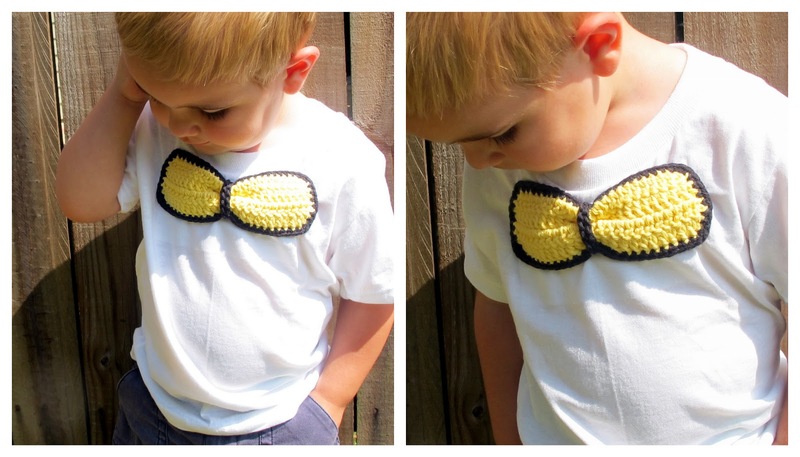 Think of what a bowtie looks like: you see the 'tails' sticking out from either end. Know what I mean? And maybe make it a little smaller and sew it higher up on the shirt. I hope you don't mind the advice! I think the idea is absolutely precious! Thank you Mom2fur, I really appreciate your feedback! That helps so much! I like them, but I would make them a little smaller. 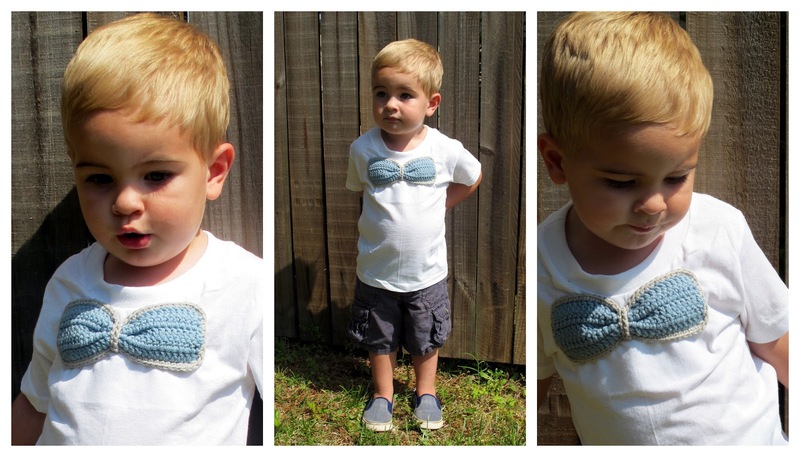 Bow ties are small compared to the size of the shirt. I like the double-layered idea, too. I'd love for you to link up at Inspire Me Mondays! It's up all week! They are adorable on the onesie!